Macadamia nuts are rich, flavorful nuts native to the continent of Australia, although they are also cultivated in Hawaii. These nuts made an important traditional food source for native Australians, who called them Jindilli or Kindal Kindal nuts. Macadamia nuts can be found in many markets, although they tend to be expensive. They are almost always found shelled, which means that they should be carefully stored so that they do not become rancid. Several suppliers also ship macadamia nuts directly to consumers. 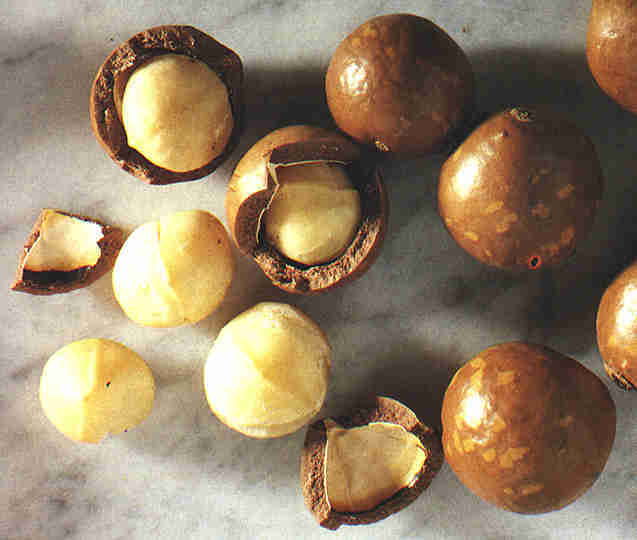 The macadamia genus includes eight species, two of which produce nuts which are a viable food source. John Macadam was the first to describe the genus, and by scientific convention, it was named for him. This genus of flowering trees is found in the family Proteaceae, and most of them actually produce poisonous or inedible nuts. Macadamia trees with food value have been cultivated for over one hundred years, and several farmers have produced distinct cultivars with unique traits such as particularly large or flavorful nuts. Aboriginal Australians made macadamia nuts an important part of their diets, since the nuts are high in protein, along with an assortment of vitamins and minerals. Early explorers in the region were introduced to the nuts, which they called Queensland or Bush nuts, in a reference to the region in which they were found. Macadamia nuts quickly became a popular food item, and several specimen trees were imported to Hawaii for cultivation in the 1880s. The nuts are now closely associated with Hawaii, with several macadamia nut producers heavily marketing their products as quintessentially Hawaiian. The nuts grow in extremely hard kernels which are very difficult to crack open. This is one of the reasons why macadamia nuts are so costly, since they are challenging to shell. Once cracked, the shell reveals an ivory colored kernel which is rich in oil with a buttery, creamy flavor. The nuts may be eaten out of hand, roasted, or ground into nut butter. Many people pair macadamia nuts with white chocolate in confections, and they can also be found in nut mixes and other desserts. Because macadamia nuts are so high in fat, you should refrigerate them for the longest shelf life. If kept at room temperature, the nuts may go rancid. Try to use macadamia nuts quickly in either case, as they generally taste better fresh. Toasting also highlights their flavor; to toast macadamia nuts, either roast them in a heavy pan or bake them, turning them occasionally until they turn golden brown. Considered to be the world's most delicious nuts, macadamia nuts are small, crispy buttery flavored nuts loved by many of us. They are nuts from the macadamia trees, which are cultivated in tropical climates and in soil rich in minerals like potassium and phosphorus. Apart from being delicious, these nuts are good sources of protein and minerals and are considered to be an essential nutritional component in many diets and recipes. These nuts are sweeter and larger than many nuts and can be eaten either raw from the shell, dry roasted or cooked in oil. Macadamia nuts are a high energy food, commonly used in preparations of cakes, confectionery, ice cream, salads, roasts and casseroles to enhance the savor. Read on further to know more about macadamia nuts nutritional content as well as various health and nutrition benefits of eating macadamia nuts. Fats: Macadamia nuts comprise 84% monounsaturated, 3.5% polyunsaturated and 12.5% saturated fatty acids. Being low in cholesterol and high in monounsaturated fatty acids which are "good" fats, macadamia nuts help in the body's manufacture of essential fatty acids by maintaining the balance between omega 6 and omega 3 fatty acids as well as increase the production of protective high density lipoproteins while suppressing the unhealthy low density lipoproteins. Hence, one of the most important macadamia nut health benefits is that being low in saturated fats and cholesterol, these nuts reduce the risks of heart diseases, stroke, anti-inflammatory diseases, anti-aggregatory diseases and immunomodulating diseases. Protein: Macadamia nuts are also rich in essential and non essential amino acids which play an important role in the body's muscle formation, connective tissues and blood plasma development and overall well-being. Minerals and Vitamins: Macadamia nuts are loaded with vitamins like vitamin E, thiamine (B1), riboflavin (B2), niacin, pantothenic acid (B5) and folate, and minerals such as potassium, phosphorus, magnesium and calcium. Hence, the nuts promote healthy bone and teeth formation, as well regulate the body's fluid balance and immune system. Also they enhance our nervous system and promotes healthy skin. Macadamia nuts are safe as food, and they seem to be safe as medicine for most people. They can cause an allergy, but this is rare. Health care providers sometimes recommend macadamia nuts to promote digestion and relieve constipation, but eating too many of them may lead to constipation or diarrhea in some people. In a preliminary study in which volunteers ate a diet containing large quantities of ground macadamia nuts for one month, researchers saw no negative side effects, and these results were similar to findings from an earlier study in which volunteers ate a diet containing large quantities of ground macadamia nuts for one month. Despite an increase in the proportion of fat in their diets, volunteers showed no significant change in weight or cholesterol levels. No negative side effects from eating the macadamia nuts were observed.